The apartment is about 61m ² and has two rooms, kitchen, shower room and balcony. It is bright and friendly designed and located on the first floor of a 3 party house. The living room is furnished with 2 sofa beds, coffee table, dining table with 4 chairs, cable TV, DVD player and a music system. So that boredom does not arise in Hamburg, there are plenty of books about Hamburg and the sights connected with them. The bathroom is equipped with shower, toilet and sink. The bedroom has a large 180cm x 200cm bed with two bedside tables and a wardrobe in which there is no shortage of space. Also you do not need to worry about bed linen and towels, everything is ready for you. The kitchen is equipped with everything you need in a kitchen. Among other things with a 4 plate stove, refrigerator, toaster, kettle, Kaffemaschiene, div pots and pans, etc. The entire kitchen and the corridor are tiled. 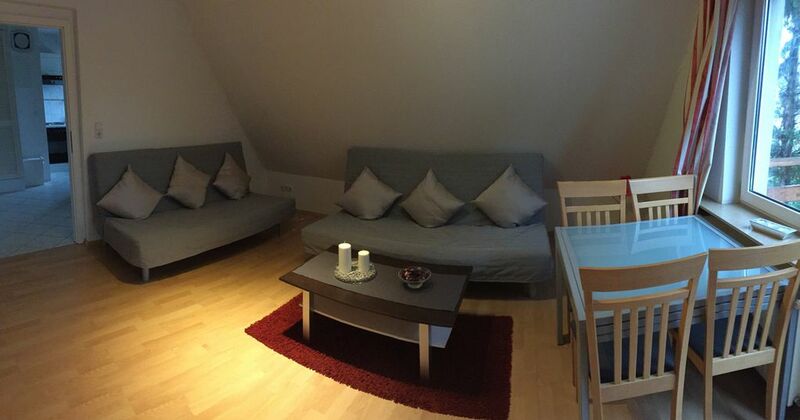 While visiting Germany from Australia, we rented this apartment for a week through HomeAway. Email communication with Marco was fast and efficient. The apartment is quite large, and equipped with all of the basics. It does show signs of wear and tear, and in need of some maintenance, but is still largely serviceable. For example, there were no racks for the oven. The location was excellent for us. A bus stop just around the corner took us directly to the Billstedt Station with trains direct to the city, and was adjacent to the large Billstedt Center shopping mall. Buses and trains were very frequent! Another supermarket was within 300 metres of the apartment. A folder of instructions for the equipment, rubbish disposal, recycling, etc would have been useful. As it was, we had to chase up the internet details, and the DVD player did not appear to be connected to the TV. EIN Fenster konnte nicht geöffnet werden. Im Elternschlafzimmer hing der Griff des Fensters runter. Möbel waren teilweise kaputt. Schlafsofa durchgelesen und dreckig. Kein Pkw - Stellplatz am Haus. Hallo Silke, danke für deine Kritik. Die Schlafsofas sowie die Essstühle haben wir Entsorgt und durch neue ersetzt. At the interchange (31) Hamburg-Ost change from the A1 to the A24 in the direction of HH-Jenfeld. Leave the A24 at the junction (2) Hamburg-Jenfeld in the direction of Billstedt, Billbrook and take the road Schiffbeker way. Follow the road for 1. 04 km. Leave the road Schiffbeker Weg and turn left into the street Fuchsbergredder. Behind the 3 white double garages left at the end of the small path is the house on the right side. You drive from the main station in the direction of Mümmelmannsberg with the U2 / U4 to the stop Billstedt. There you take the bus 27 to stop Fuchsbergredder. Now go the Fuchsbergredder and turn left into the small path behind the 3 double garages. The house is at the end on the right side.